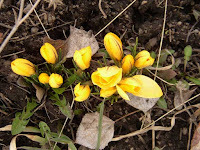 Some crocuses blooming on my otherwise rather brown and dry perennial hill in the backyard. I can see them from my sewing room window. I've got about 4 projects in the works right now and having fun going between them as I'm inspired for each next step. I never used to be able to work on more than one project and it caused a lot of down time because if I didn't know what to do next I didn't do anything. Now I usually can think of something to do for one of the projects and I've even completed a couple this last week! I'll have some new things to hang in my two month show at the Rocky Mountain Bank in downtown Stevensville. I'll be hanging that show next Wednesday and am looking forward to seeing how it is received in my home town. Our project for our textile arts group (TARTS) this month was air dry clay that you can push into rubber molds and make very lightweight molded objects to attached to art quilts. 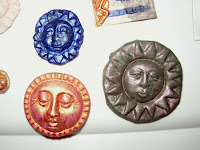 My mold had sun motifs and I molded and then painted three of them to use on a piece. Painting them was very fun as it makes them look like stone. One of them I rubbed on some antique gold Rub'n Buff with my finger and it highlights the raised parts of the motif very nicely. This was a fun, easy project and once I got the hang of getting enough baby powder into the mold to prevent sticking, I really enjoyed working with it. I intend to get some more of the air dry clay which is made by Crayola. 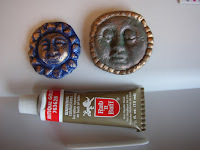 I finished two other small pieces this week each using one of the clay suns. I finished another piece last week which has some cutouts, reverse applique (hand work), machine applique, some beading, and some nice quilting. 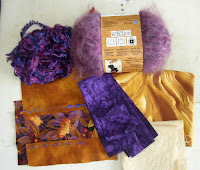 First picture is some fabrics and fibers I auditioned for the piece. Did not use any of the fibers. The second picture is the auditioning of beads for the piece. 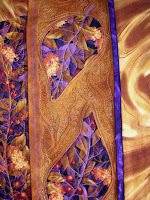 I was really happy with how the quilting came out in the center section around the purple leaves (the reverse applique). It reminds me of tooled leather. Hopefully you can see the detail in the picture. This weekend we are going to take our trailer up to Freezeout Lake (near Great Falls, Montana) for our yearly outing to see the Snow Geese that migrate through there. There are about 50,000 of them right now and hopefully the numbers will stay up for the weekend. They are fascinating to see in such huge numbers and sleeping in the trailer with them flying overhead most of the night is a neat experience. It is usually cold and windy so we spend most of the daylight hours driving around the area exploring whatever there is to see. I will be taking my sewing machine in for a yearly checkup to the dealer that is in Carter, Montana. They are nice enough to do the cleaning/maintenance during the time we are up there camping, usually getting it all done while I do some shopping in their great quilt shop, The Quilted Hen. I plan to hit the Choteau quilt shop (newly relocated) as well. I'm quilting on my brown tree quilt and it is going slowly and somewhat painfully. I'm not really liking what is happening. That frustration led me today to start a brand new little piece since I really want to do something that I can get DONE. I have it almost all piece together but it still needs a little something. I usually hang them on my design wall and then as I come and go or even just turn away and back again, I sometimes will see what is needed or what is bothering me about it. Sometimes I fold up pieces of fabrics that I think might add something and pin them up there in some fashion to see if they work. This is when my stash gets really messy as I'm pulling things out and not always folding them up neatly to put back where they should go! A few days ago I had someone in the fabric store ask me what I was planning to make with the fabric I was buying. I always find this interesting because I rarely have anything in mind when I buy fabric. I just add it to my stash. If it is something really lovely I might hang it up on the side of my design wall so I can see if it inspires anything. When I plan to make something I will usually start with a key fabric and then pull other things out that might go with it. 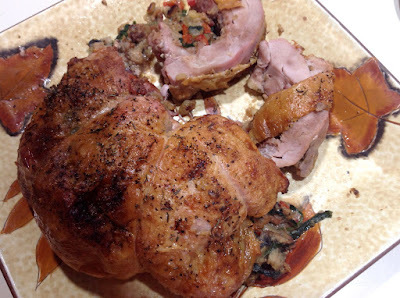 I like to choose unlikely pairings quite often and really shake it up. I think that's why some of my pieces have been successful and created lots of interest. 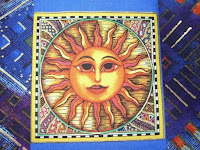 Unusual fabric combinations are fun to challenge yourself with and make them work. 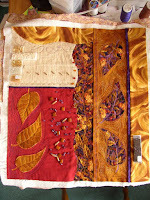 Sometimes I also like to use the organic lines of a scrap or remnant piece as it is to create unusual lines in a piece. I did that with a piece of scrap suede that I had which was oddly shaped and I just used it as it was as the focal point of a piece. Easier to do with things like suede, felt, felted wool and fleece which all have edges that don't ravel, but cotton can work too. I usually stitch my raw edge pieces with a narrow zigzag using clear polyester thread. In a few weeks I'll be getting my quilts ready to exhibit at the local bank, Rocky Mountain Bank, on Main Street in Stevensville. They will be there for all of April and May. I am still debating about how many and what quilts to take there, but I'm leaning towards mostly smaller pieces. Hopefully I will have a few new pieces for those who have already seen what I had in the gallery in January and in the textile arts show in Hamilton in February. I think everything will be for sale and I hope to have some lower priced pieces that might sell better in this economy than my larger pieces. I'm watching the Celtic Women on PBS and getting quite distracted as I try to type this! I particularly like the Irish and Celtic songs as opposed to when they sing American tunes. Although I have to say that "You Raise Me Up" is good no matter who sings it.